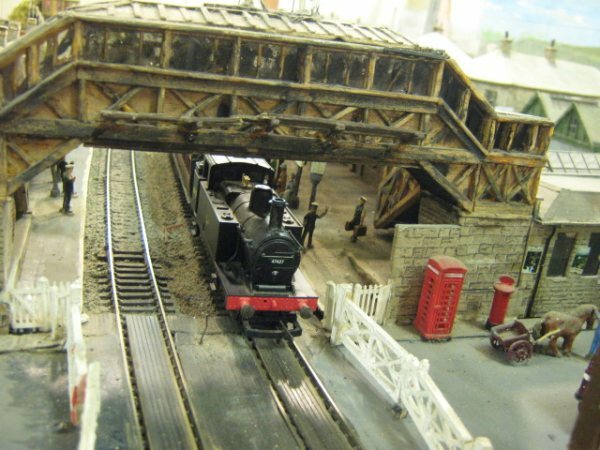 My aim here is to try and see if we can recreate some pictures from the olden days and see them in today’s view and even in 00 gauge view from the layout. This will include some features such as Railway Stations, Streets, Mills, Pubs and more. 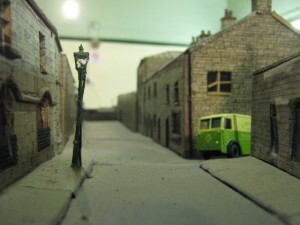 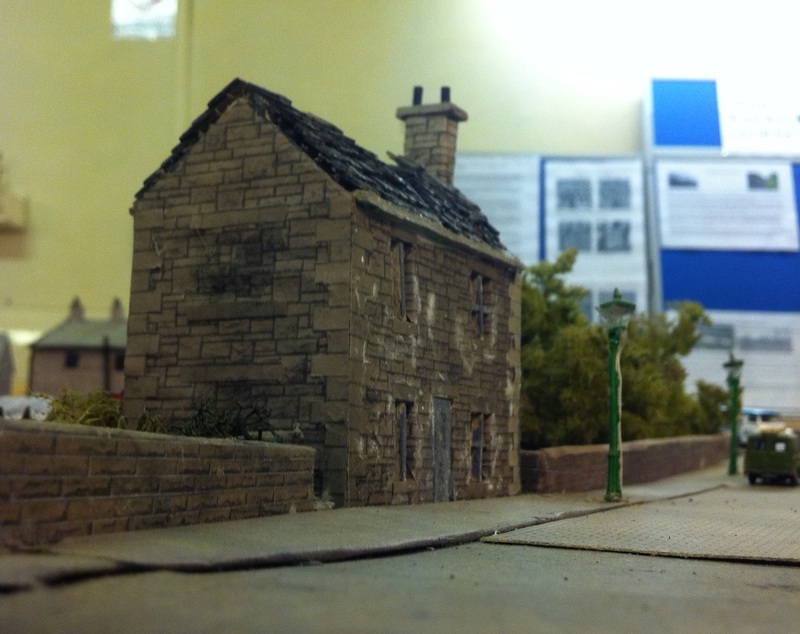 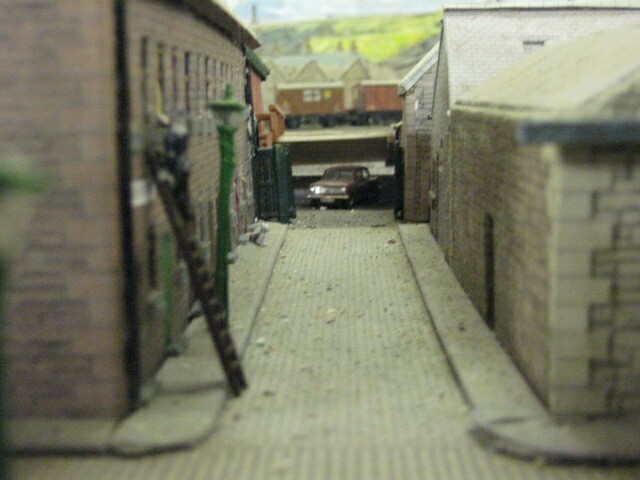 This is looking down Bridge Street towards Ramsbottom (left in 2010) and on the right is our model of Ramsbottom in 1950’s. 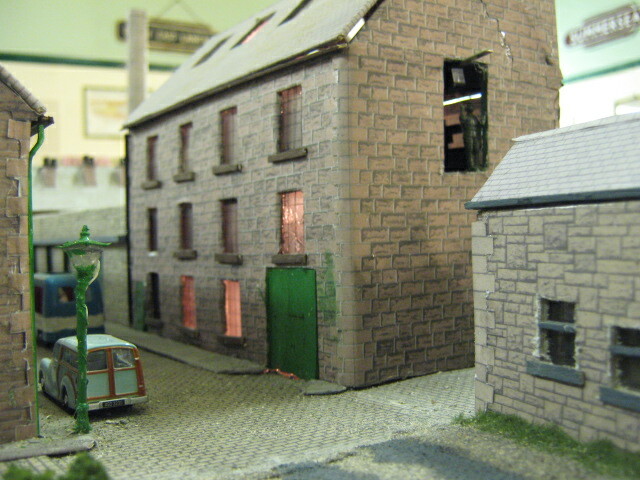 Notice between the two pictures that some buildings have been demolished such as the Toll House (small building with damaged roof) The old Police Station (building behind the toll house on the right), The Weigh Building to weigh wagons on at the Paper works. The picture on the Left is of Irwell Bridge Mill and was taken during 2010 and shows a failed attempt to convert this building into apartments so now its left empty and will probably end up demolished. 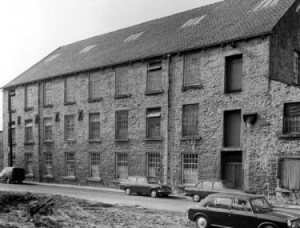 But the right hand picture shows this building during its glory years of the 1950’s. The picture on the left is Peel Bridge when it was only a single bridge over the River Irwell and also shows a row of shops this being the start of Peel Brow. 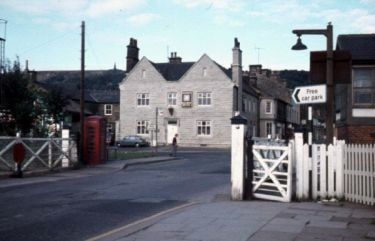 This picture is dated 15th October 1969. 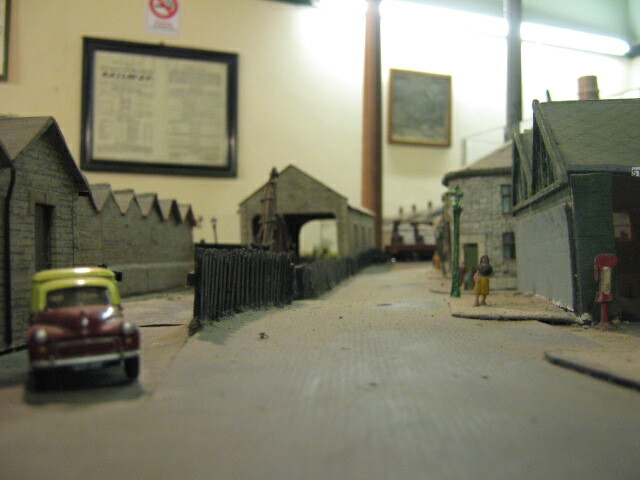 The picture on the right is of the same location but in model in the 1950’s showing roughly the same location. 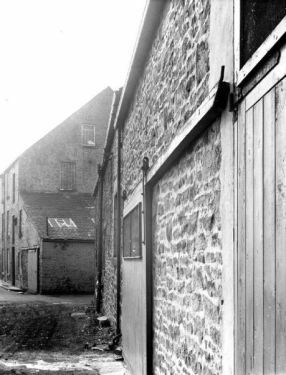 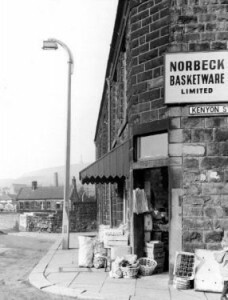 The picture on the left is a view from Kays Soap works in October 1969 and is looking towards Kenyon Street. 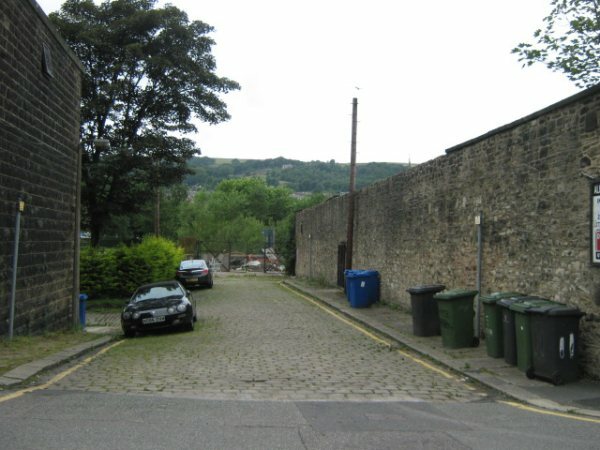 The picture on the left is in model and looking up the same street. 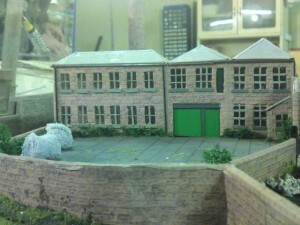 I have tried to copy the image on the left with that in model. 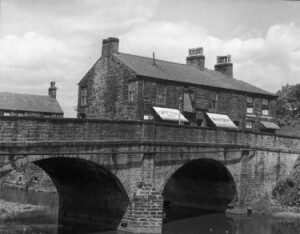 The picture on the left shows the shops on the start of Peel Brow this is also where Kenyon Street meets up with Peel brow, also in the back ground is the single span Peel Bridge that would take you into Ramsbottom. 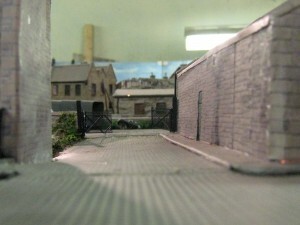 The picture on the right is a copy of that imagine on the left but is in model. 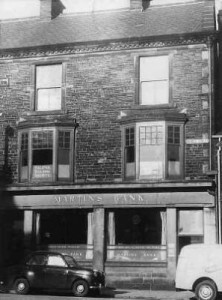 The picture on the left shows Martins Bank which later became Barclays Bank, Notice the 3rd Floor which was removed in the 1970’s. 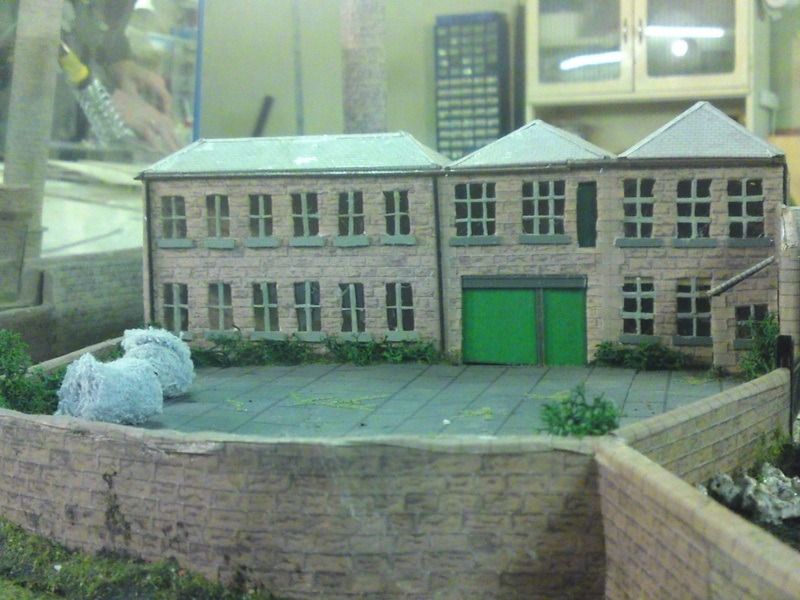 The picture on the right shows the same buildings but as they were in the 1950’s on our layout. You may notice that Barclays Bank has 3 stories well this is because the 3rd level was removed in the 1970’s. The picture on the left is dated from 1980s and shows a shop called Wilson’s which was a bookies on Bridge Street. 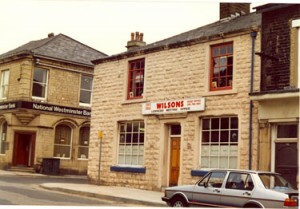 Been informed by Roger Wilson (no relation) that it was a bookies after being a pub and Wilson’s bookies was its name. The picture on the right shows what the shop use to be before it became Wilson’s Bookies, Station Hotel. 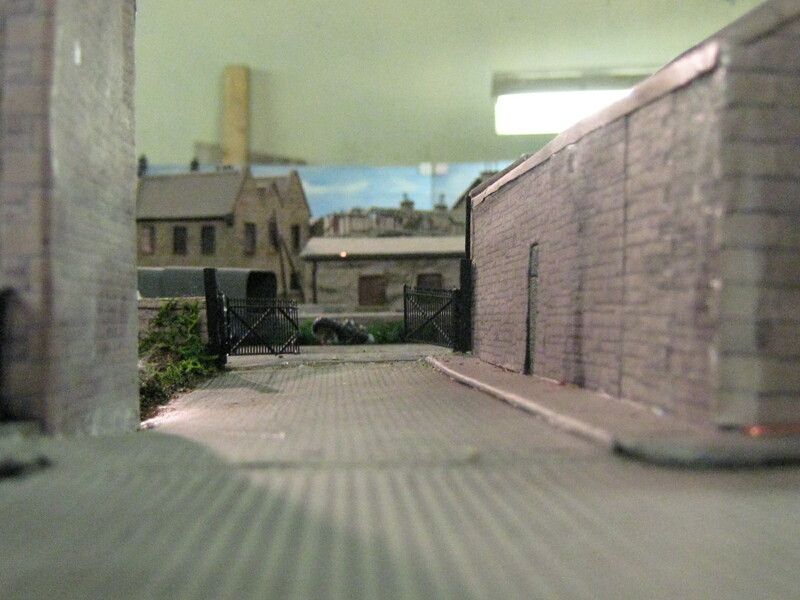 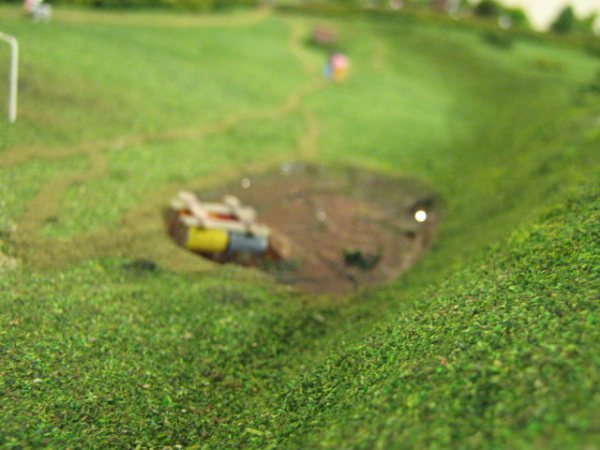 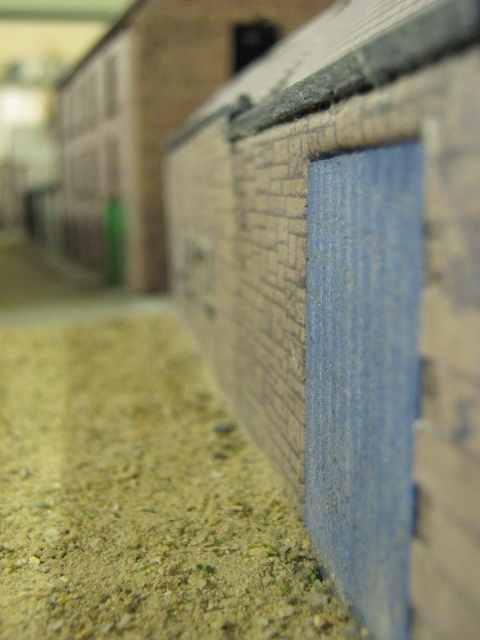 This is taken on our model layout. 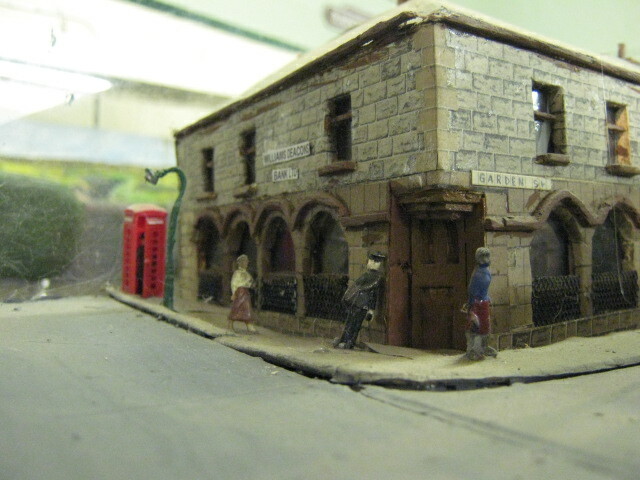 This Pub/Bookies is now a bookies called Totes bookmakers. 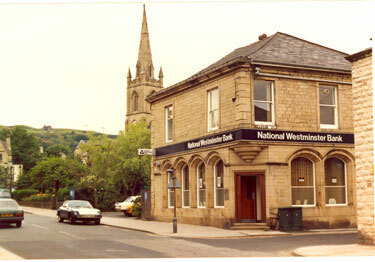 The picture on the left shows what is today the National Westminster Bank or Nat West for short on Bridge Street taken back in 1980. The picture on the right shows what the bank was originally called William Deacon’s Bank LTD and is modelled in the 1950’s. The picture on the left is taken from Kenyon Street looking down Harrison Street towards where the old Irwell Saw Mill was located, This now has has units built upon it including Ross Vale Tyres. 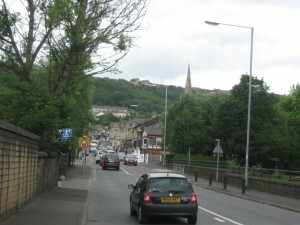 This picture was taken July 2010. 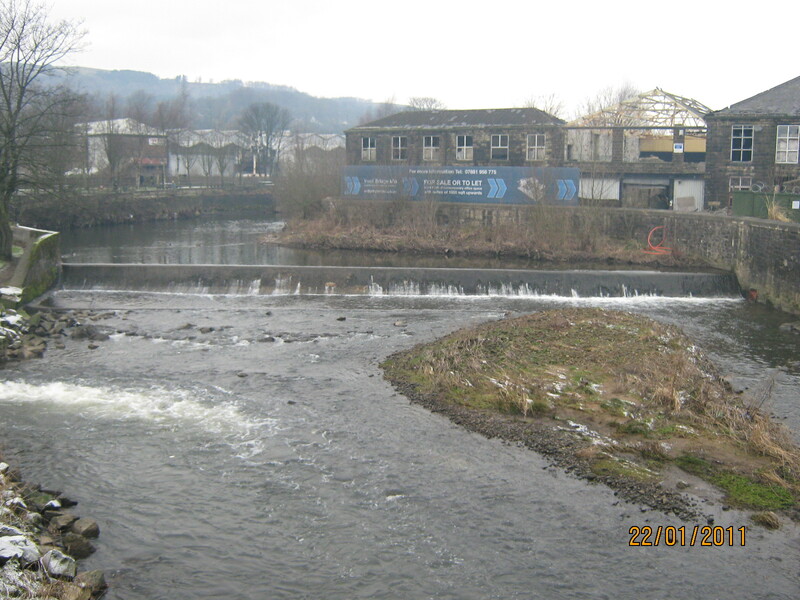 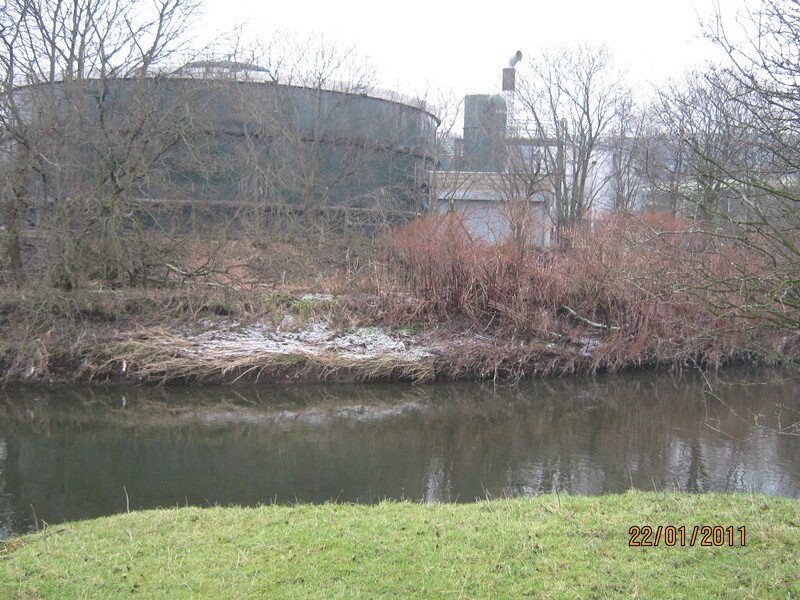 The picture on the Left shows the same located but is modelled in the 1950s and in the right hand picture you can see part of Irwell Saw Mill in the back ground. 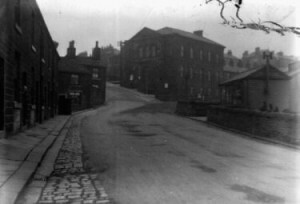 The picture on the left shows Stead Street from Kenyon Street looking on towards the remains of Irwell Bridge Mill on the right. 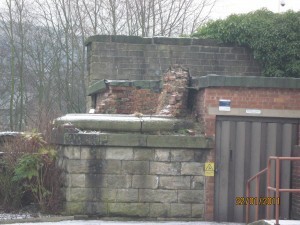 This building was sold some time ago to be converted but has only had its roof removed and is in a dangerous way. This image was taken July 2010. 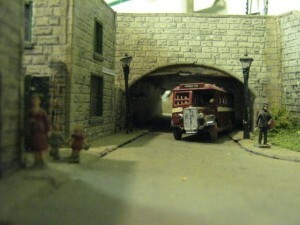 The picture on the right is in model from the 1950s and shows the same location. The picture on the left shows Ramsbottom Station taken from the pedestrian footbridge and shows 50829 with long bunker built 1898 leaving Ramsbottom for Bacup sept 1953. 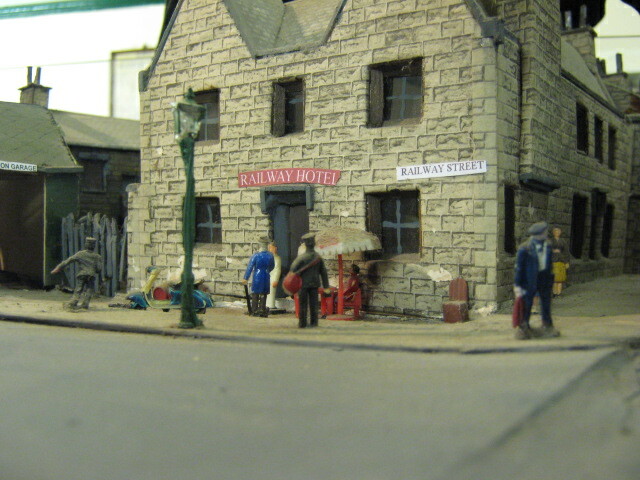 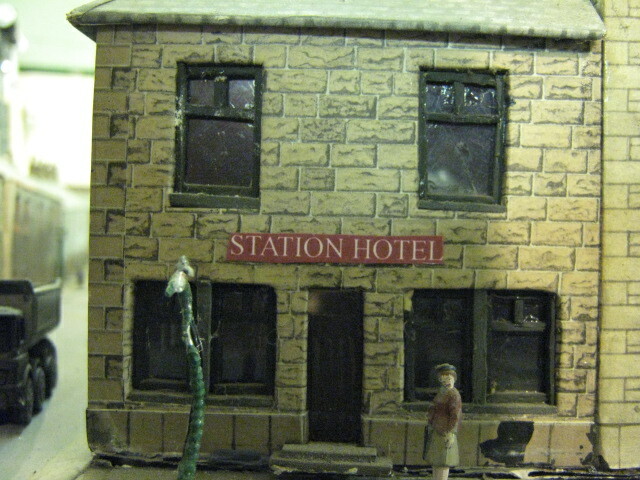 The picture on the right shows Ramsbottom Station in model. I just need to have the same steam engine in place. The picture on the right shows Field Mill, a three storey mill at the bottom of Kenyon Street. . 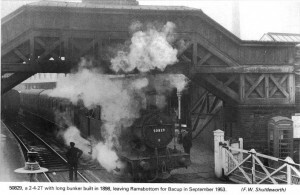 The picture was taken in October 1953. 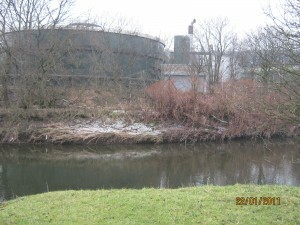 The picture on the right is of the same location but take July 2010, this mill was demolished some years back due to being unsafe. 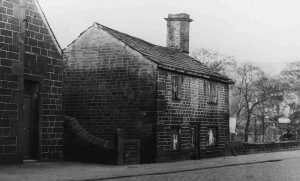 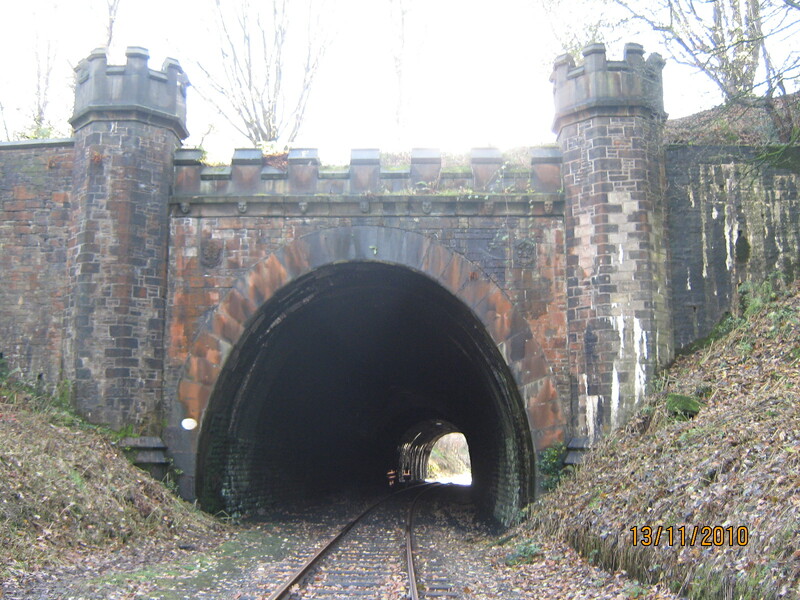 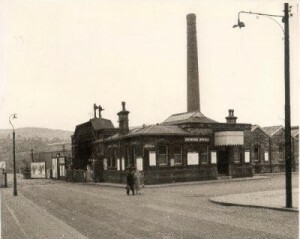 The picture on the left shows the original Ramsbottom Station taken at the junction of Bridge Street and Railway Street. 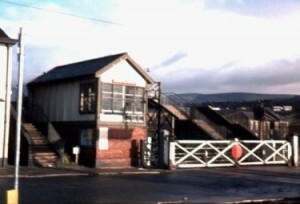 The original station was demolished back in 1972. 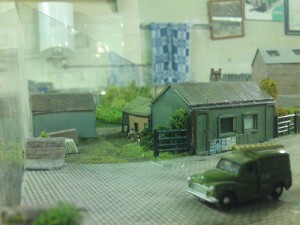 This picture looks like it was taken sometime in the 1940’s. 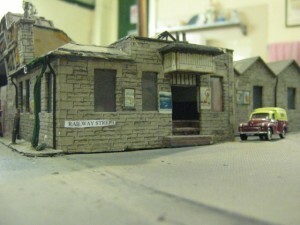 The picture on the right shows the original Station but in model around the 1950s era. The picture on the left shows Ramsbottom Signal Box in 1974 and even still has the pedrestrian footbridge running around the back of the box. 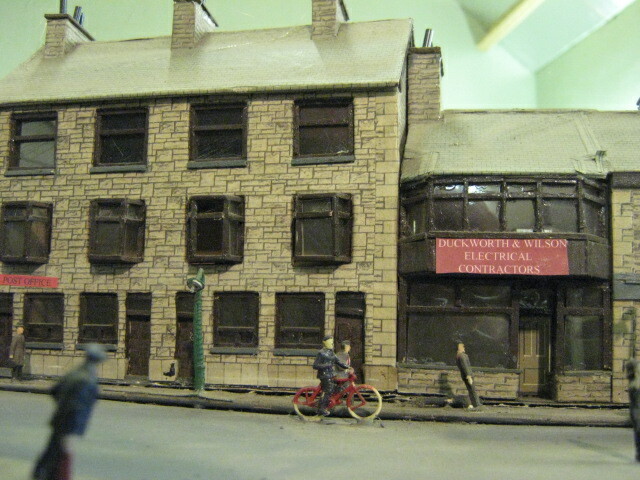 The picture on the right shows the same location but is in model around the 1950s era and shows the original Police Station. The picture on the left shows The Railway Hotel in 1974 at the junction of Railway Street and Bridge Street. The picture on the right shows the same location but modelled in 1950s era. 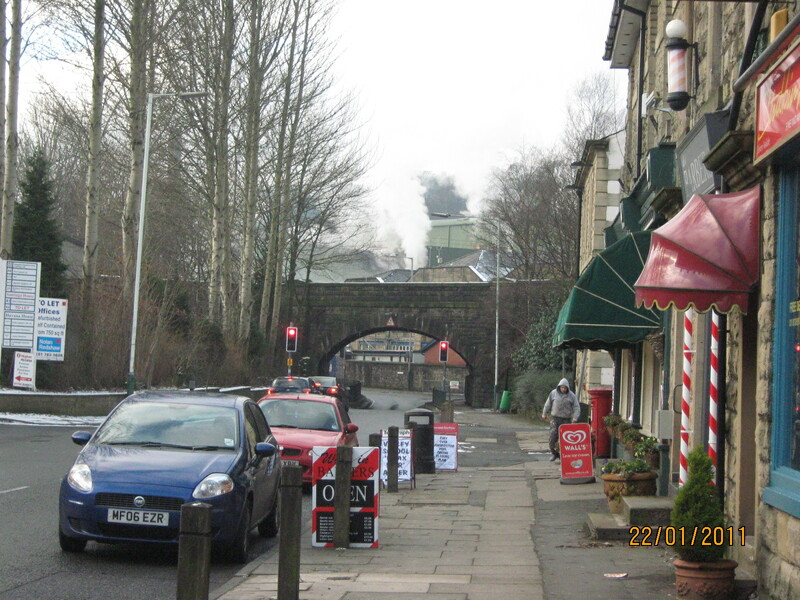 The picture on the left shows the remains of the chimney during 2000 while the picture on the right shows the same chimney in 1950/1960. 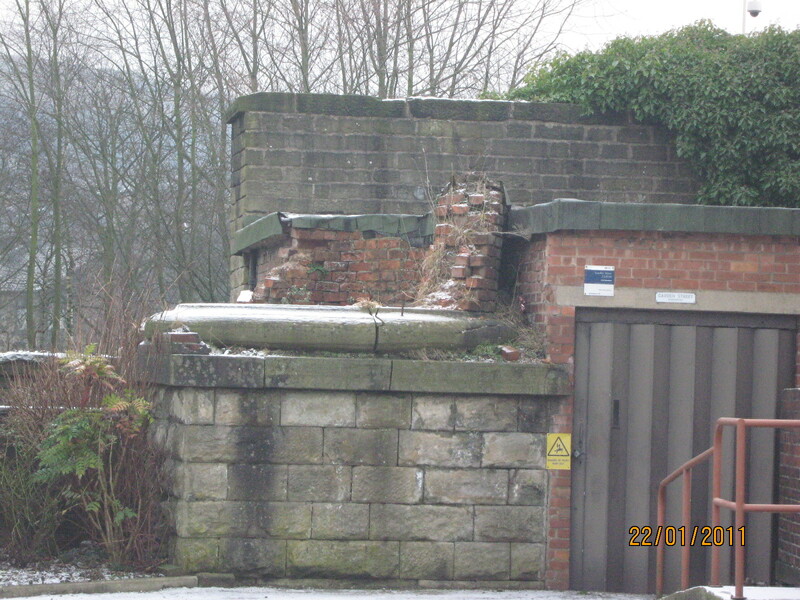 This chimney is located by the mill on Garden Street and at the rear of Barclays Bank on Bridge Street, As you can see not much remains today but a stud of the base. 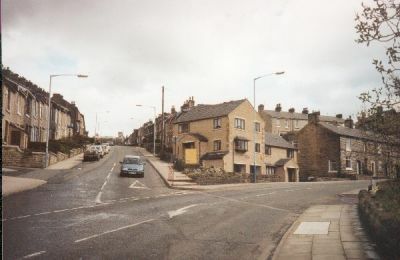 This view shows the builders yard on Peel Brow opposite Kenyon Street in 2000 during its derelict years. 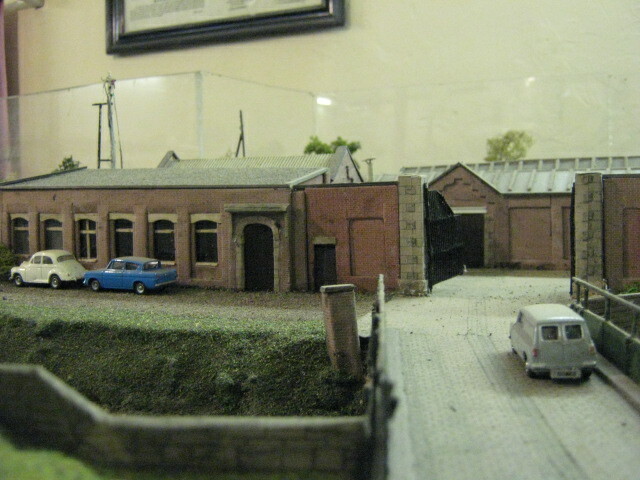 The view on the Right shows the yard in 1950/60 in 00gauge model. 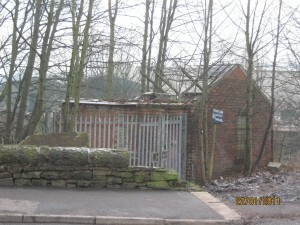 The Builders yard today in 2010 is looking even worse for wear with hardly no roof standing and shows signs of total decay. 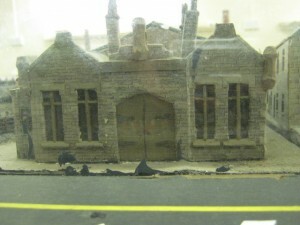 The view on the left shows the Army Cadet Detachment in 2011, The difference between our model on the right and the today picture on the left can clearly be seen that the front entrance has been bricked up and a window placed in the middle. 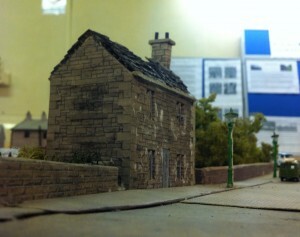 Our model shows how it would of looked during the 1950’s. 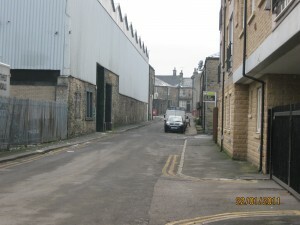 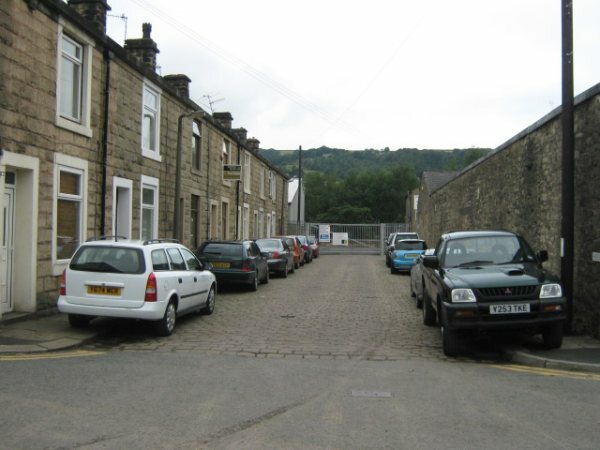 The view on the left shows Garden Street in Ramsbottom in 2011 with new build apartments on the right occupying the old Amtron Flooring Warehouse. Also in this shot is Hambletons Removers which are located in an old mill. 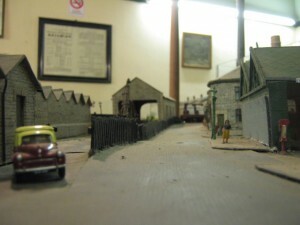 The picture on the right shows Garden Street in 1950. The view on the left shows the Railway Street access road by bridge over the River Irwell and into the compound of Cormar Carpets Holcombe Mill. 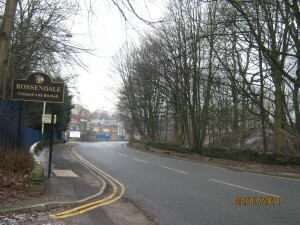 This road also leads into Nuttall Park by following the path to the left after the bridge. 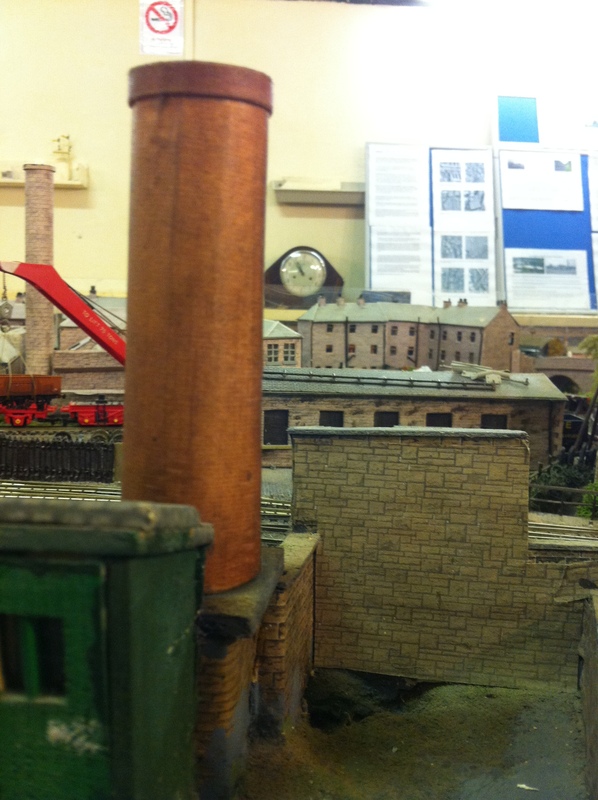 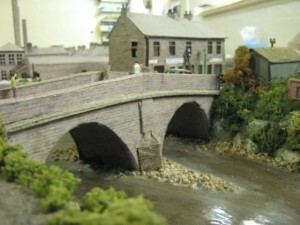 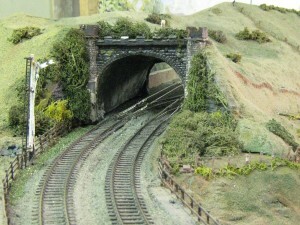 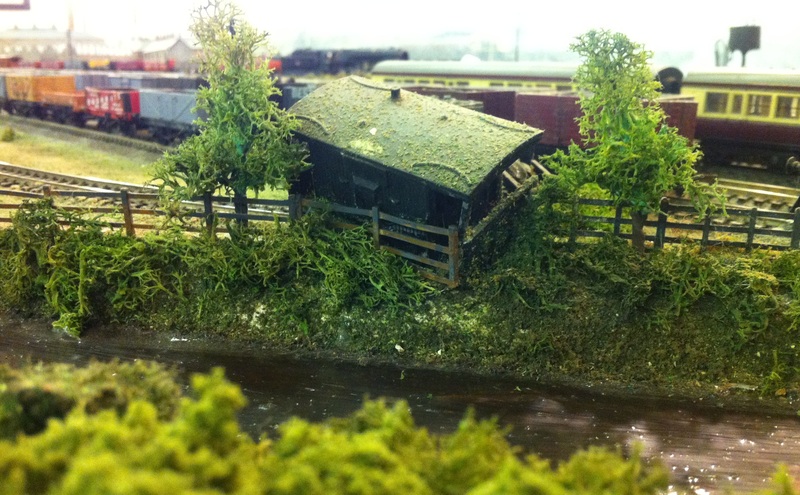 The view on the right shows the same location but on our layout during the 1950’s but was know as Holcombe Mill then. 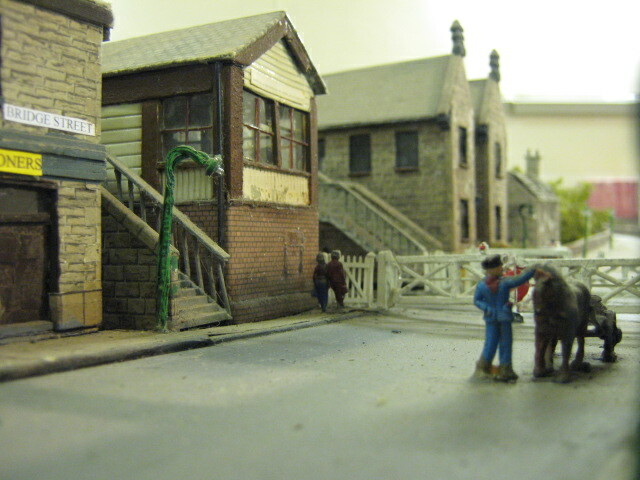 The view on the left show Stubbins Lane looking towards Stubbins with Stubbins Mill on the left, Station/signals in the middle and Signal Box (Stubbins Junction) on the right. 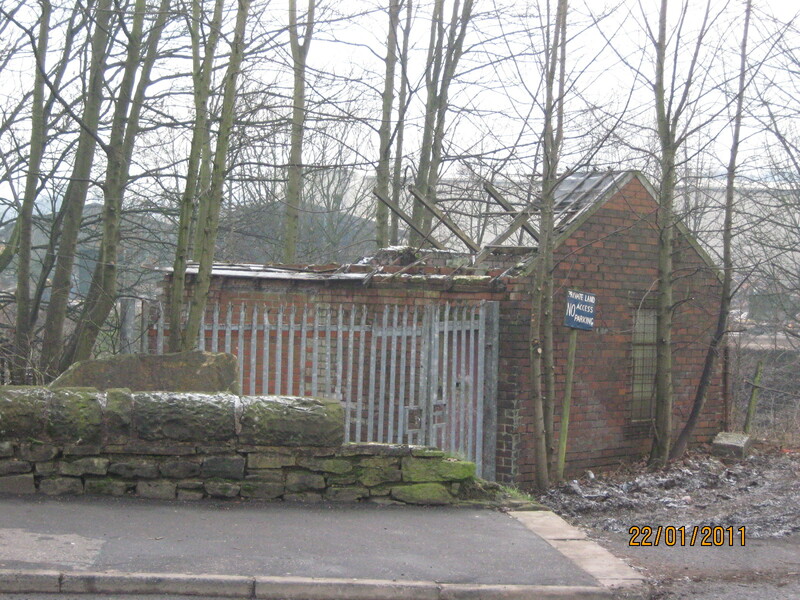 The picture on the right shows Stubbins Lane during 2011 on the left you can see Georgia Pacific (Stubbins Mill) but the trees on the right are obscuring the view of where the signal box and station once stood. 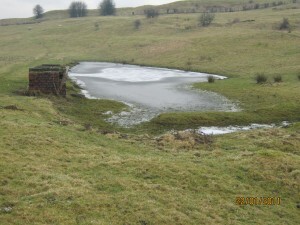 The view on the left shows the lodge in 2011 which is located just past the soap works after Kenyon Street, The brick structure to the left was likely to of been some sort of pumping device. 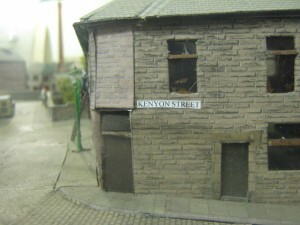 The picture on the right shows our version of the lodge set in 1950 but looking in the opposite direction back towards Kenyon Street. The barrels you see are made up to look like a raft that the local kids have made. Left :- Bolton Road North looking towards Stubbins Lane and the bridge that carries the ELR through the remains of Stubbins Station. 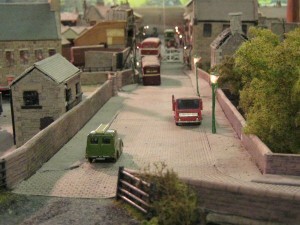 Right :- The same location but looking from our layout in 1950. 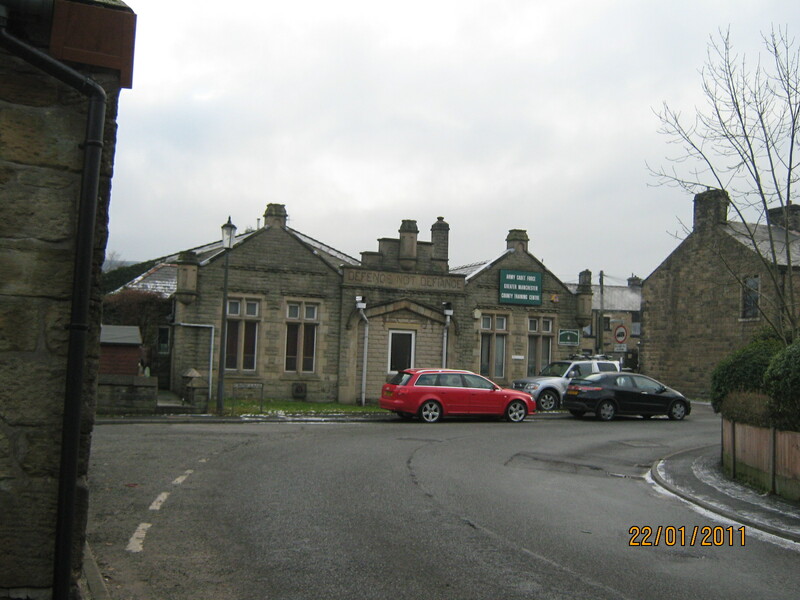 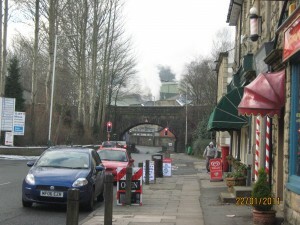 The picture to the left shows Railway Street in 2011 where it meets Bridge Street complete with the Station Garage, Budha Lounge and the ELR Ramsbottom Station to the left. 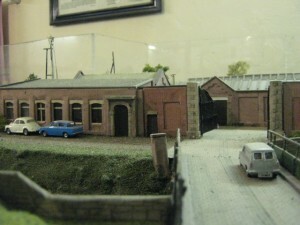 The picture on the right shows the same location but set back in the 1950s on our layout complete with the station garage, Ramsbottom Station and Goods shed to the left. 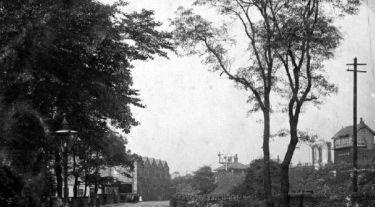 The picture on the left is taken on Peel Brow in 1910 with Bury New Road diverting off to the right of the picture before the impressive Old Patmos Church. 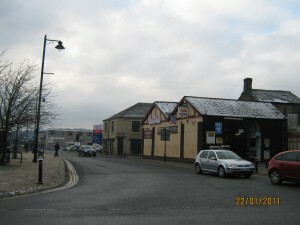 The rows of houses to the left are now the beer garden for the Good Sam pub. The picture on the right was taken roughly on the opposite side of the road in 2011 looking in the same direction as you can see the church has now gone due to dry rot and was pulled down in the 1970s to be replaced by apartments in the 1990s. 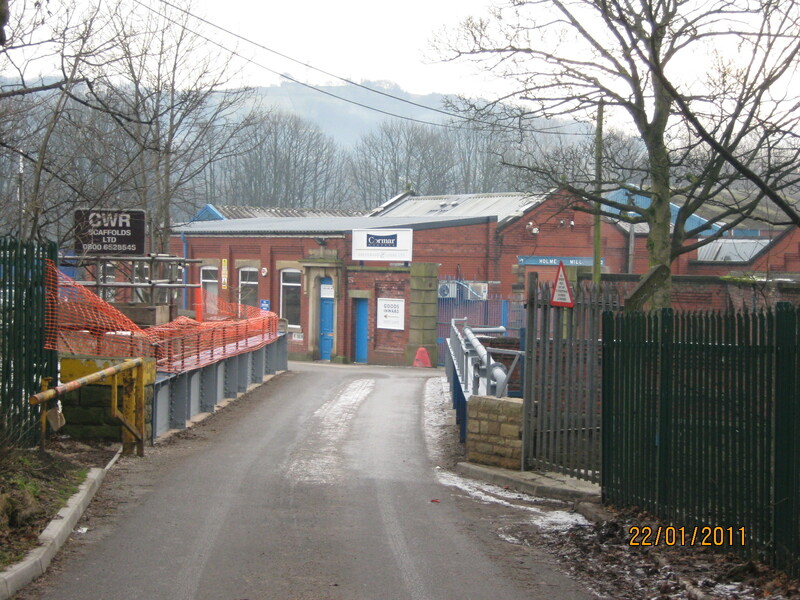 Left :- This shows me looking across to what is now Georgia Pacific silo plants on the old Ramsbottom Sidings. Right :- This shows one of the guards vans that has gone a little bit too far and is now being used as a buffer stop roughly in the same location. Left :-This view shows the old Toll house on Bridge Street around 1930ish, Right :- This is the view of the same location roughly around 1950 in model.